We've just added some new lenses to our already great selection! 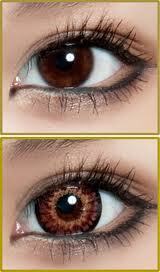 Princess Mimi Chocolate Brown is back in stock after being sold out, and comes in prescription strengths. The Princess Mimi series, designed by Tsubasa Masuwaka really gives a bold effect, which shows up great and still looks natural in photos. 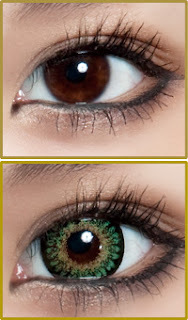 They are 15mm in diameter, and will really make your eyes look big and bright! In prescription strengths from -.50 to -8.00 in -.25 increments (eg; -1.00, -1.25, -1.50 etc..) We should have the correct strength for you in stock for only $30.67 Buy Your Circle Lenses Here! If you prefer a lens that looks more natural close up, then you may like our newest addition, Besvue's Daisy series in Green, Brown, and Grey. These lenses are 14.5mm which will make your eyes appear bigger, and will have a more natural looking effect than the Princess Mimi series would. Besvue's Daisy series is only $28.06, and comes in prescription strengths from -1.00 to -6.00 in -.50 increments (eg; -1.50, -2.00, -2.50 etc..) so everyone can have big beautiful eyes! No matter which lenses you choose, you get a free lens case with your order, as well as shipping for only $5 with tracking! My, What Prominent Limbal Rings You Have!